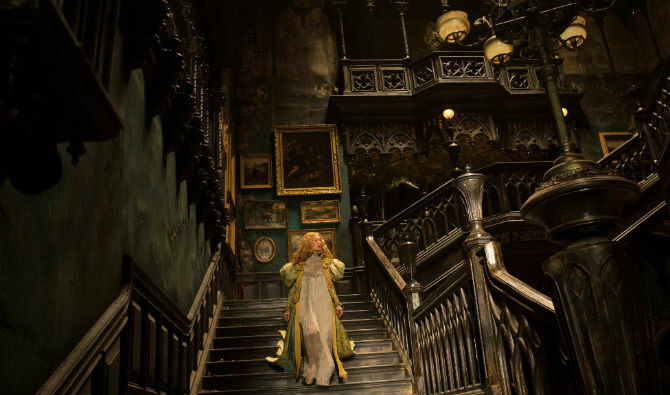 'CRIMSON PEAK' REVIEW - WHAT HAPPENED? Oh how I wanted to love this movie! I've been looking forward to this movie for over a year...then it came out. The movie was so disappointing that I wasn't sure I had the heart to review it . To get myself into a romantic mood while writing this review I decided to watch for 'You've Got Mail' with Meg Ryan and Tom Hanks for the 20th time. Hopefully, my review will be nicer because of it. 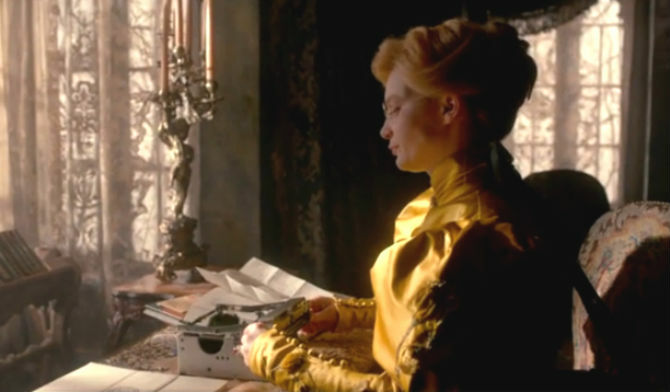 First I want to say that 'Crimson Peak' is a beautifully filmed sumptuous movie. It's gorgeous. The production designs and the costuming are a feast for the eyes. Secondly I would argue that 'Crimson Peak' is not a horror film, it's a Gothic romance that happens to have ghosts in it. The film has been inappropriately marketed and perhaps that's part of the problem: false expectations. The film begins well enough, but the problem soon becomes apparent. The storyline is overly simplistic and predictable. It almost felt like I was watching a film from the 1950s or 1960s. Even the classic film 'The Innocents' (1961) had a few interesting twists and turns, not so with 'Crimson Peak.' 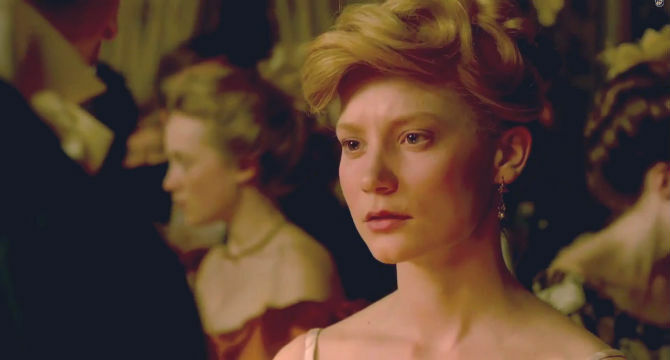 Our heroine is the lovely and independent Edith Cushing (Mia Wasikowska). Edith is the precocious daughter of wealthy American industrialist Carter Cushing (played by the incredible character actor Jim Beaver) and an aspiring author. Edith hopes to be the next Mary Shelley (don't we all). Haunted by mother's ghost since she was a child, Edith wants to write supernatural fiction, but is soundly rejected by the powers that be and told to stick to "women's topics" like romance. Disenchanted and embittered, Edith meets the dashing Sir Thomas Sharpe of Allerdale Hall played by the equally dashing Tom Hiddleston. Competing for her affections is eye doctor and childhood friend Alan McMichael (Charlie Hunman). Honestly, it's not even a competition. Of course Edith falls for Sir Thomas...for goodness sake he's played by Tom Hiddleston. Unfortunately Sir Thomas is also accompanied by his mercurial sister Lady Lucille Sharpe (Jessica Chastain). Because Edith's dad wasn't born yesterday he has the Sharpes investigated, which reveals some unfortunate information. Edith's father is mysteriously killed in a very violent manner. Then the newly minted heiress is whisked off to Sir Thomas' crumbling estate in merry ole' England. Sir Thomas' manor sits on top of a great mountain of blood red clay, which is used in brick-making. Needless to say things aren't as Edith had expected. Her prince lives in a rotting mansion and his sister treats her like crap. Chastain brilliantly plays a deliciously cruel Mrs. Danvers-like character. In fact, this may be Chastain's best work in years. If the storyline had been better perhaps this role would have had more impact. So long story short, Lucille is out to get Edith so they can steal her money and move on to the next poor victim. Lady Lucille and Sir Thomas have been engaged in an incestuous relationship and killed their mother when it was discovered. Now they kill Thomas' brides as soon as the money rolls in. As I said, once you know the twist, which really isn't a twist, it's so unbelievably boring that you can't believe you actually sat through this movie to get here. Needless to say the "fit hits the shan" when Edith discovers this "secret" and Dr. McMichael comes to "rescue her. Despite Thomas' bad intentions he falls in love with Edith..., which was a tad too predictable. He ultimately decides to protect his wife from the evil wiles of his dastardly sister. I guess those other girls he married didn't stand a chance. Oh...I'm so glad Thomas finally grew a conscious. Wouldn't you hate to be the wife right before Edith? Thomas defends his wife, only to be killed by his enraged sister in the process. Dr. McMichael and Edith are wounded but alive. Edith kills Lady Lucille. The end. When I first saw the trailer I thought that perhaps Sir Thomas and Lady Lucille were some sort of immortals. When I learned about the reason behind the title "Crimson Peak" I thought the clay held some mystical properties. Perhaps Jessica Chastain and Tom Hiddleston's characters were secretly married themselves, instead of being incestuous siblings? However, my main issue with the film was the ending. If I had wrote the ending Edith would have bit the dust or became an immortal herself trapped in the same cycle that they were. I don't know. Anything would have been better than the craptastic ending that was. Alas, it turns out that my imagination is way more interesting than the actual movie itself, which frankly surprised me. This is a Guillermo del Toro movie for goodness sake. Shouldn't he be capable of writing a dark and twisted love story? Instead, we get a rehashed version of the novel (and film) 'Rebecca.' Mind you, 'Rebecca' was written by the brilliant Daphne DuMaurier in the 1930s. This is 2015. Couldn't Del Toro have come up with a more modern concept? Nope. I gave the film three stars simply for the production value and the visuals and JESSICA CHASTAIN, who carries this otherwise bland film. Yikes, I guess watching 'You've Got Mail' while writing this review didn't help. I saw Sicario instead. Guess I'm glad I did. Thanks for the heads up. I might still go see it, but at least I'll know what to expect. Which is a shame, as I was hoping for another film along the lines of The Devil's Backbone. I really wish I would have seen 'Sicario' instead. I heard 'Sicario' is great. I have been meaning to see it. 'Crimson Peak' is definitely a rental. Nice review! I saw this on opening day and still have to write my review. I really liked Crimson Peak, but it could have fared better. The exclusion of the mother's ghost to me was the weakest part of the ending. So much of Lucille and Thomas' childhood/messed-up ness centered around her and her ghost/soul didn't play a part? Otherwise, the gothic-romance over the gothic-horror wasn't too bad but the studios marketed the film terribly. This is where it suffers the most for people who are expecting one thing and get another. Hi Katy! Thanks. I think that was the main problem for me. My expectations were off. The marketing was terrible. I thought the film was decent, but could have been so much more. I do wish there woul have been more of a focus on the mother too! That's such a good point! I absolutely agree with that assessment. Chastain is fantastic. She made the movie for me. That and the production values, which were incredible. I am so sad that the storyline wasn't better. I was so looking forward to this film. You're right about the marketing. This kind of alludes to something I thought about as well, I don't think anyone knew what they wanted this movie to be. I feel like del Toro wanted it to be a Gothic love story, like you said, but the people in charge of post production wanted it to be a horror movie, and that really killed the tone. It's like it was being pulled in a tug of war. I don't think it's bad, but it didn't meet my high expectations either. I agree. it wasn't bad, but it wasn't great. I had such high hopes for this film. I think that was part of the problem. Your comments are right on the money! Thank you! I did like it. I think I was harsher than perhaps I should have been. Like you said it was so mismarketed! I think that was my main issue...my own expectations. I'm looking fwd to seeing your review. Wow, that is disappointing. I agree, I thought it would be something more complex and sinister with the trailers. Possibly involving monsters, since this is del Toro. Exactly! That's why I think it's my own expectations that ruined this film for me. It's del Toro? What happened? Crimson Peak is definitely so much below Pan's Labyrinth and The Devil's Backbone when it comes to depth, symbolism, imagery, interpretations, cultural, political, social and human ties and layers that brilliantly intermingle, spring ones from the others, continue themselves into these two movies etc etc....Still, Crimson Peak is a grandiose movie when it comes to setting, atmosphere, costumes, music, colors and the way all these pour and drip ones into the others just as red impregnates into everything in the movie. Del Toro is definitely a genius for having such a grandiose vision and for daring and trying to make it come to life. Hi Dorina, thanks for your comment! Your comment was a lovely mini-review in of itself. You make some good points. No one does atmosphere like del Toro. I totally agree about 'Pan's Labyrinth' and 'Devil's Backbone.' I thoroughly enjoyed both of those films. They were brilliantly crafted. 'Crimson Peak' was beautifully done, but I found the storyline to be so simple. I was really surprised by that b/c of del Toro's reputation. I probably won'y see this movie, but I Really appreciate all the work you put into your posts. Thanks! Aw thanks! I think you should see the movie just for the visuals. It's quite spectacular visually speaking. The problem is the storyline. I don't think the film would be the same on the small screen. Alternative movie plot: Edith falls in love with detective Holly, they marry as soon as possible, and have a looot of kids. Sir Thomas Sharpe eats his hat. Sorry, it was my Burn Gorman tribute. God I love that man! That would have been a much better ending! Thanks for the comment.